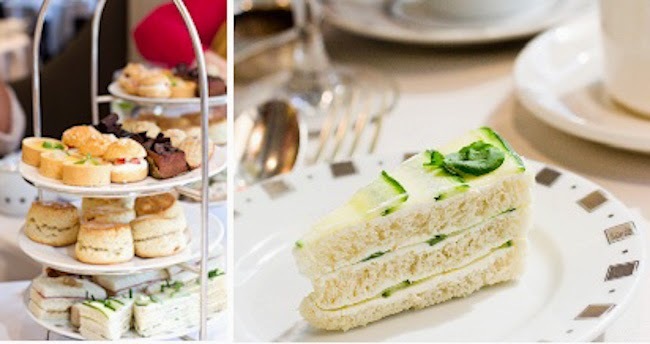 This week we're covering an Afternoon Tea staple: the Cucumber Sandwich. The execution of a perfect cucumber sandwich is more difficult than you would think. The bread needs to be perfectly fresh and whether to peel the cucumber is a hotly-discussed topic. Luckily, we've got it covered, here at Elena's L'Etoile! 1) Cut the cucumber into slices as thin as you can make them, and put in a colander or sieve. Sprinkle lightly with salt (don't go overboard) and leave for 20 minutes. Taste to check you haven't oversalted them: you can rinse them at this point if so. 2) Lay out a few pieces of kitchen paper on the work surface, place the cucumber slices on them, and pat dry with more paper. 3) Lay out the bread and butter each slice generously. Arrange the cucumber on half the slices, overlapping each round, and sprinkle with ground white pepper. Top with the remaining slices. 4) Pressing down firmly, cut the crusts off, and then cut into neat fingers, triangles or quarters of roughly equal sizes. Serve immediately, with good tea. 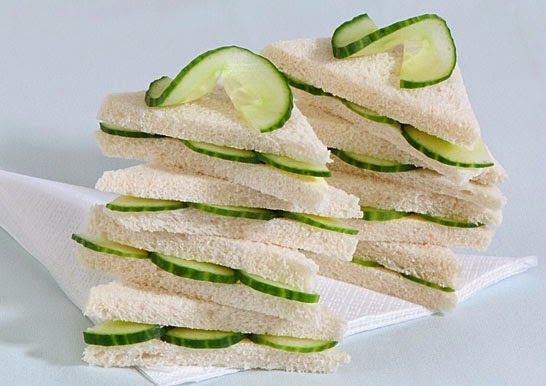 Cucumber sandwiches: are you a fan, or are they a silly Victorian affectation that deserves to go the way of the top hat and the whalebone corset? And if not, what do you like to do with this most refreshing of vegetables? As of the 15th January, we have been serving Afternoon Tea at Elena's. 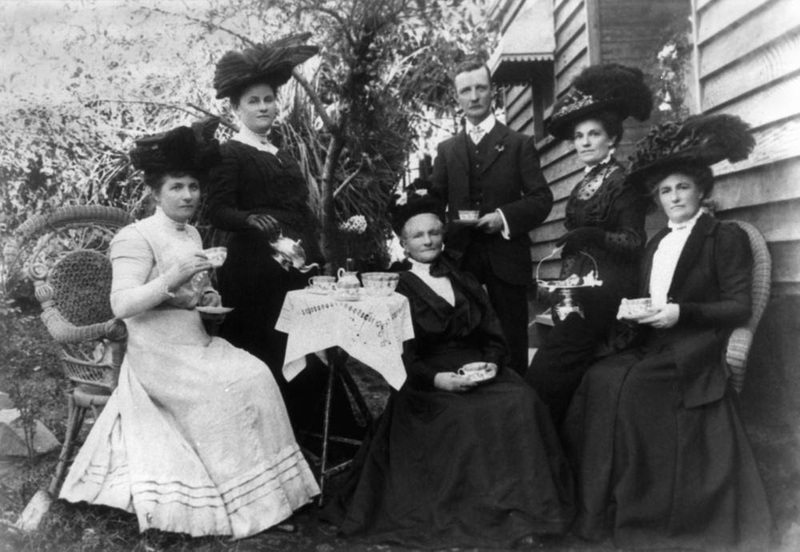 Afternoon Tea is one of our favourite classic British pastimes and we thought it would be fun to examine the history behind it. 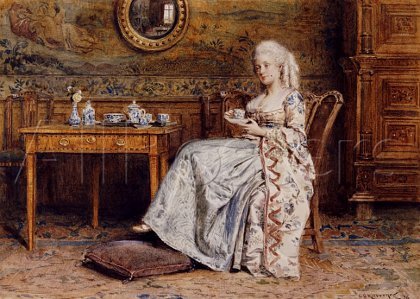 Tea consumption increased dramatically during the early nineteenth century and it is around this time that Anna, the 7th Duchess of Bedford is said to have complained of "having that sinking feeling" during the late afternoon. At the time it was usual for people to take only two main meals a day: breakfast, and dinner at around 8 o'clock in the evening. 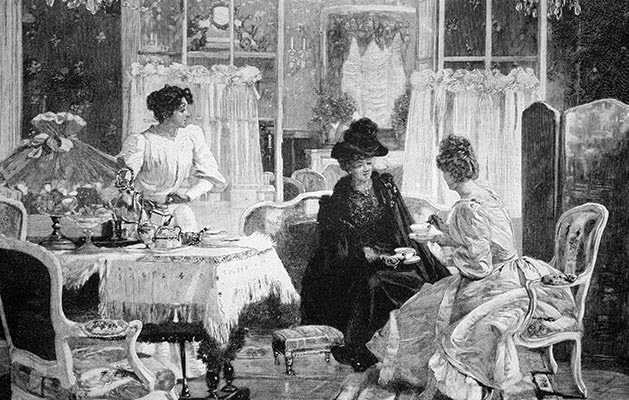 The solution for the Duchess was a pot of tea and a light snack, taken privately in her boudoir during the afternoon. Later, friends were invited to join her in her rooms at Woburn Abbey and this summer practice proved so popular that the Duchess continued it when she returned to London, sending cards to her friends asking them to join her for "tea and a walking the fields." Other social hostesses quickly picked up on the idea and the practice became respectable enough to move it into the drawing room. 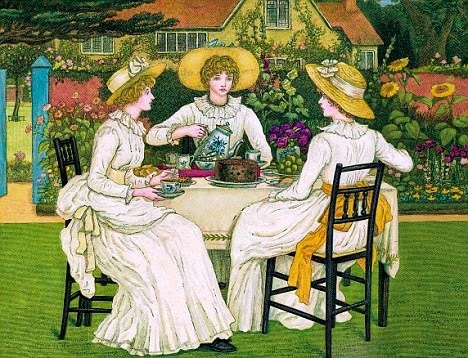 Before long, all of fashionable society was sipping tea and nibbling sandwiches in the middle of the afternoon. Many visitors from overseas still imagine that we are a nation where, in the words of the well-known song, 'at half past three, everything stops for tea'. 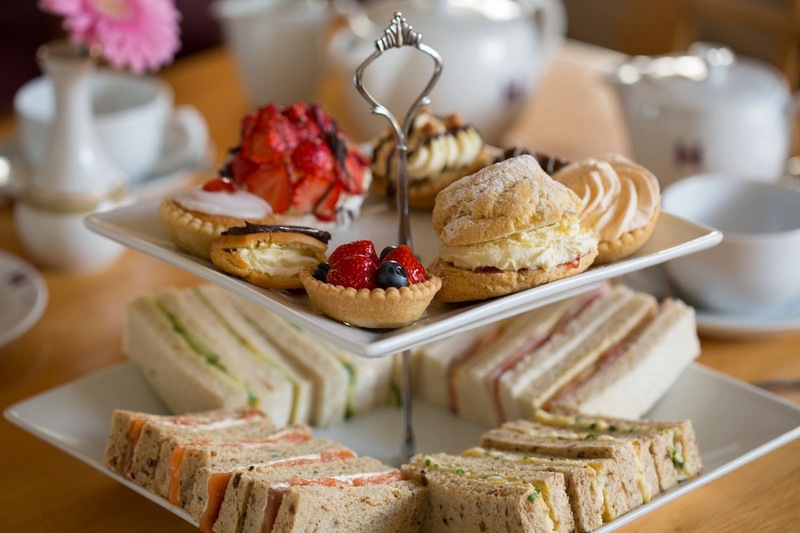 Sadly, these days Afternoon Tea is usually only an occasional luxury for the British; a birthday treat in a country house hotel, or a welcome break from a hectic days shopping 'in town'. That said, it has remained such a popular phenomenon that it has spawned its own website, a handy help for any tourists still hoping to indulge in a little bit of British tradition for themselves. We're very excited to announce, that, as of 15th January, Elena's will be serving Afternoon Tea from 12.30-17.30 Monday - Saturday. We'll be serving the finest selection of teas together with freshly baked scones and sandwiches. In fact, you should check out the menu for yourselves! 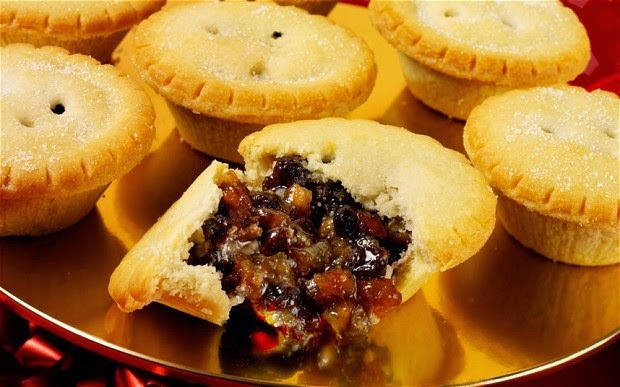 The mince pie is the quintessential Christmas food! This small fruit-based mince meat pie was traditionally served during the Christmas season. Its ingredients are traceable to the 13th century, when returning European crusaders brought with them Middle Eastern recipes containing meats, fruits and spices. Christmas would not be the same without mince pies, but please don't buy them! You must make your own, and, with our recipe, you can make perfect pies every time! 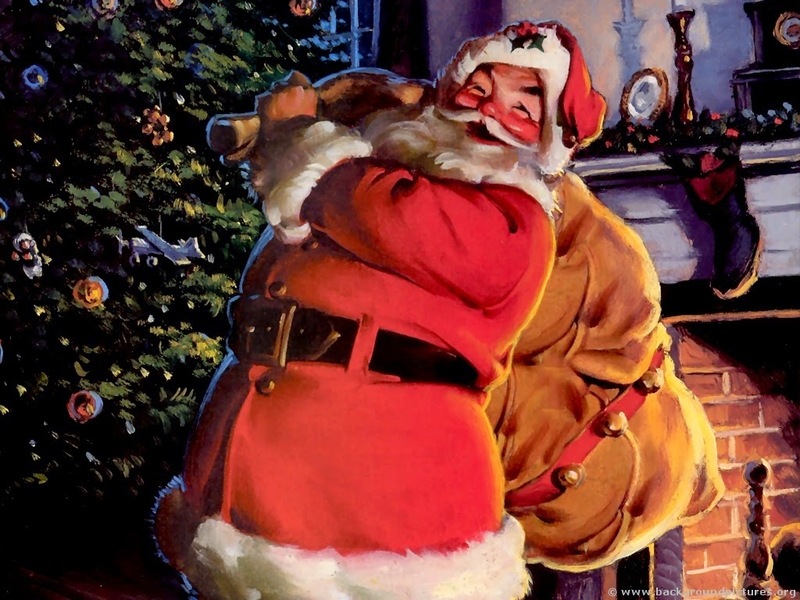 The image of Santa Claus has become synonymous with Christmas but not many people know the origin of him and his name. Let our blog fill in the blanks! Over the course of many years, Nicholas’s popularity spread and he became known as the protector of children and sailors. His feast day is celebrated on the anniversary of his death, December 6. This was traditionally considered a lucky day to make large purchases or to get married. By the Renaissance, St. Nicholas was the most popular saint in Europe. Even after the Protestant Reformation, when the veneration of saints began to be discouraged, St. Nicholas maintained a positive reputation, especially in Holland. The name Santa Claus evolved from Nick’s Dutch nickname, Sinter Klaas, a shortened form of Sint Nikolaas (Dutch for Saint Nicholas). In 1804, John Pintard, a member of the New York Historical Society, distributed woodcuts of St. Nicholas at the society’s annual meeting. The background of the engraving contains now-familiar Santa images including stockings filled with toys and fruit hung over a fireplace. Today I interviewed Manuel, our wonderful floor supervisor that has worked at Elena's L'Etoile for almost twenty years! Originally from the small town of Tabuasco in Portugal, Manuel moved over to London in 1985. Although he was initially reticent, the promise of a good job was more than enough to sway him. Manuel started out as a comi waiter (someone who brings food from the kitchen to the table) before working as a bar man. Since then he's been working as a supervisor at Elena's L'Etoile for the past 16 years! Manuel becomes misty eyed when previous manageress Elena, and namesake of our wonderful restaurant, is brought into the conversation. He tells me the following: 'Elena started work at 14 years of age. She got to know all the customers and shared their secrets with her. She knew everybody and everyone knew her. She, personally, brought a lot of custom to the restaurant'. Undoubtably this lead to Elena's tenure at L'Etoile being so very long. When asked about his own tenure at Elena's and whether he would ever wish to move on, Manuel's answer is a passionate NO!. When asked why should people go to Elena's, Manuel is emphatic in his reply 'good food and good service - what more could you want?'. Manuel says that the most difficult thing about his job is the long restaurant hours - sometimes as many as 14 hours a day! Indeed, Manuel can see himself here for the next 16 years! Manuel then goes on to explain that Charlotte street has changed a lot in recent years. Many of the old restaurants have closed, and Elena's is the one of the only which still remains. Elena's orignally opened in 1896 and is still here today, over 100 years later. In addition to his hectic life at Elena's, Manuel is also a father of two children - 10 month old baby boy, Tiago, and 6 year old Gabriel. Now that Christmas is just around the corner, it's time to get those Christmas tunes going! If you're struggling for inspiration, then look no further than our Christmas playlist!